Rajkumar Santoshi’s The legend of Bhagat Singh, hailed as an authentic slice of history on the screen. But is it not paradoxical that the title of the movie was in English, the language of the people against whom Bhagat Singh had fought? Sanjeev Kumar played old man on the screen so many times that he virtually ended up glamorising such roles. Ironically, the actor died without attaining old age in real life. Whenever a film-maker abandoned his favourite cinematographer and opted for a new one, he faced a row of flops? Sawan Kumar changed his favourite cinematographer Manmohan Singh after Sanam Bewafa and gave flops like Sanam Harjai, Bewafaa Se Wafaa, Salma Pe Dil Aa Gaya and Dil Pardesi Ho Gaya. 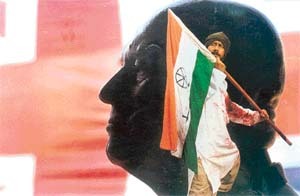 Inder Kumar, a successful filmmaker, changed his long-time cinematographer Baba Azmi after Ishq and found Mann and Aashiq sinking without a whimper. When N. Chandra abandoned Baba Azmi after Tezaab, he suddenly became a flop director what with Narsimha, Yugandhar, Wajood, etc coming a cropper at the box office. Whenever a movie had more than one cinematographer, it failed to create a stir at the box-office? (1942: A Love Story, Dushmani, Dillagi and Pukar). Also, whenever direction passed from one hand to another because of the death of the original director or for some other reason, the film did not fare well at the box office (remember Johshilay, Barsaat, Dillagi, Love and God, Meri Biwi Ka Jawab Nahin, Jung, Chameli, Roop Ki Rani Choron Ka Raja, Chameli and Guru Dev?). Long titles became a fashion following the success of Hum Aapke Hain Koun.... and Dilwale Dulhania Le Jayenge. V. Shantaram and Nasir Hussain, too, were fond of long titles? The former made Jhanak Jhanak Payal Baaje, Geet Gaya Patthron Ne, Boond Jo Ban Gayee Moti and Jal Bin Machhli Nritya Bin Bijli, the latter made Jab Pyaar Kisi Se Hota Hai, Phir Wohi Dil Laya Hoon, Hum Kisi Se Kum Nahin, Zamaane Ko Dikhana Hai, Qayamat Se Qayamat tak and Jo Jeeta Wohi Sikander. Despite box office success, such titles did not become a fad. Whenever O.P. Nayyar composed a song with horse gallops’ sounds in the music, it invariably hit the bull’s eye (Maang ke saath tumhara in Naya Daur, Piya piya piya mora jiya pukare... in Baap Re Baap, Yoon to humne laakh haseen dekhe hain in Tumsa Nahin Dekha and Zara hauley hauley chalo morey saajna.... in Saawan Ki Ghata). In 1967, B. Nagi Reddy made Ram Aur Shyam, based on the confusion caused by two identical faces, with Dilip Kumar playing a double role. It has been stated any number of times that in the later years, G.P. Sippy and A. Puranchandra Rao lifted the story from Reddy’s movie for their movies, Seeta Aur Geeta and Chaalbaaz, respectively. Actually, what went unnoticed was that Reddy too had picked up the idea from Padmini Pictures’ Dil Tera Deewana (1962) which had a sub-plot with Mehmood’s double role creating all the confusion. Vyjanthimala and Reena Roy had refused to accept the Best Supporting Actress Award for their roles in Devdas and Apnapan, respectively, claiming that they were actually the leading ladies of these movies and, therefore, should have been considered for the Best Actress Award. These actresses commanded the image of being level-headed. 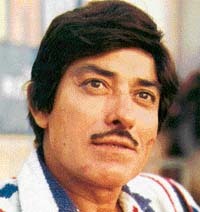 Interestingly, Raaj Kumar, who was called an eccentric by the entire film industry accepted the Best Supporting Actor award for Dil Ek Mandir and Waqt without creating any fuss. Looking at the roles he played, he could have claimed that he should have been given the Best Actor Award. There are several interesting facts about Raj Kapoor and his family. The great showman was so possessive about the titles of his movies that he would get each of these re-registered every 10 years so that no filmmaker would be able to use them. Interestingly, R.K. himself did not mind picking up a title for one of his movies (Sangam) from a movie made in 1954. Only those sons of Raj Kapoor and Shashi Kapoor made it big in filmdom who were launched in home productions. Rishi Kapoor began his career as a child artiste in Mera Naam Joker and as hero in Bobby. 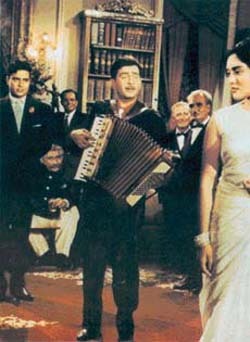 Similarly, Randhir Kapoor made his debut as the lead artiste in Kal Aaj Aur Kal. Both attained success. Rajeev Kapoor, made his debut in F.C. Mehra’s Ek Jaan Hain Hum. Shashi’s son Kunal Kapoor began his film journey with Esmayeel Shroff’s Ahista-Ahista and brother Karan Kapoor did it with Arjun Hingorani’s Sultnat. None of them had a long innings. It was a well-known fact that Raj Kapoor was opposed to the idea of Kapoor girls acting in movies. A paradox, is it not, that at present the only person representing the Kapoors is Kareena?